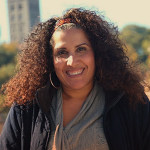 Mary Taveras Garcia, LCSW, CASAC is the director of the ALICIA M. FERRER Mental Health Clinic. Ms. Taveras Garcia has been employed in various capacities at ICS for the past 25 years. She has been a clinician in ICS’s Youthlink; Drop In; and Mental Health Clinics, before assuming the Unit Director role in 2012. Mary has a Masters Degree in Social Work from Fordham University, and is a Certified Alcoholism and Substance Abuse Counselor (CASAC).